It’s been a while since I wrote one of these, but I’ve been reading some comics in my off time from working on Headshots from the Heart, which is an awesome fundraiser I’m involved with to help children’s hospitals. Check it out! We have a ton of great sponsors, and it’ll be a lot of fun. 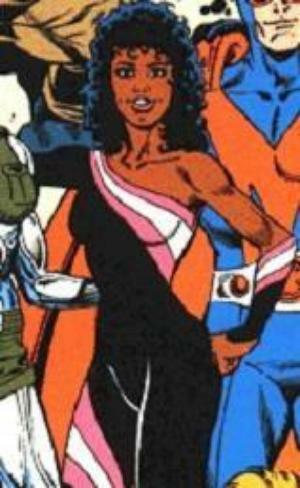 Plugs aside, I ran across this character in an obscure Marvel comic, and something about her really hit home. DP7 or Displaced Paranormals ran in the late eighties in under Marvel’s New Universe imprint, and told the story of people who were given paranormal powers by a cosmic event. Unlike Marvel’s other group of people who develop strange powers, the X-Men, these people didn’t put on costumes and begin fighting crime. They’re not superheroes, they’re just people trying to get through their day. Spending most of their time at a clinic for paranormal research, they’re caught up in their own relationships and the machinations of those who would use them to further their own ends. Charlotte Beck is one of these paranormals. Charly to her friends and Friction to the audience of the comic, she can make surfaces frictionless, or incredibly sticky. Powers were pretty weird in the eighties, but that’s beside the point. She loves dance, is loyal to her friends, and fancies a doctor who’s got strange psychic selves living inside him. During her time at the clinic, the paranormals begin the fragment, splitting off into different groups. One of them is made up of black paranormals. Another group is formed by people under twenty, and a third by women. Each group feels marginalized by the clinic staff’s treatment of them. I can’t sing the praises of the narrative here, given that most of the characters in the groups seem to have been created specifically to flesh out the groups, but the interesting thing is that Charly fits into all three of them, and is pressured to join each one, but none of them incorporates her entirely. She’s not black or a woman or paranormal or young, she’s all of those things. Asking her to choose between them, or to separate the kind of feelings she has from one and from the others is downright foolish. At the same time that these comics were running, Kimberlé Crenshaw was publishing her first paper on Intersectionality Theory, a sociological theory which argues that the influence of oppression can’t be restricted to one aspect of a person. Black women will have a genuinely and interestingly different perspective than white women or latina women, and further differences such as age and economic status can compound these complications. All of these factors help create an individual’s standpoint, which gives them a unique kind of knowledge about their situation. Trying to subsume that knowledge into a larger whole results in the loss of some information. In feminist scholarship, that information often has to do with the source of oppression. It can be unclear whether it’s based on race, gender, class, or something else. This doesn’t prevent the use of statistics to help find patterns in these kinds of things, but is something we need to be conscious of. So what can we learn from Charly? In short, people are complicated. We’re messy. We’re never just one thing or another, we’re a lot of things all jumbled together. No one is just a woman, or a Republican, or a gamer, or a parent, et cetera, and anything which tries to reduce them to one such attribute doesn’t properly appreciate the diversity of their values and the origins of those values. Charly ultimately rejects each group which reduces her to a part, and finds her place among friends who appreciate her as a whole. The New Universe may not have any superheroes, but there’s something to be said for that.